Everyone needs a little brush-up on their grammar and their editing skills because everyone is a writer these days. From social networking to writing copy for our own Web sites to blogging, our writing know-how is on display as it never has been before. Regardless of our profession. Regardless of our age. Older folks find that grammar rules and style choices change over time. The youngest group of writers might need to get over some bad habits fostered by texting. And many will be surprised that writing online may require a different skillset (other than the technical part) than writing for print (and vice versa). An example: If you’re writing for online consumption, you may want to use a type font like Verdana that was developed for reading on screen. If you’re submitting something for print as a writer or in the business world, you may be safer with the tried-and-true New Times Roman that studies have shown is easier to read in print. · AP Stylebook, by Associated Press. Especially good for those who write for newspapers and some magazines. · Lapsing Into a Coma: A Curmudgeon’s Guide to the Many Things That Can Go Wrong in Print—And How to Avoid Them, by Bill Walsh. · Bryson’s Dictionary of Troublesome Words: A Writer’s Guide to Getting It Right, by Bill Bryson. · Chicago Manual of Style, by the University of Chicago Press Staff. · Eats, Shoots & Leaves: The Zero Tolerance Approach to Punctuation, by Lynne Truss. Especially good (and fun) for those writing for the UK market. · Far From the Madding Gerund, by Geoffrey K. Pullum et al. · Garner’s Modern American Usage, by Bryan A. Garner, is excellent for Americans. For our purposes—that is not to rile an agent or publisher—choose the more formal of possibilities it offers. If the suggestion feels stilted, rearrange the construction of your sentence. · Grammar Snobs Are Big Meanies: Guide to Language for Fun & Spite, by June Casagrande. Use this book when you want to be informed and confident enough to edit on your own or to judge the expertise of the editor you hire. It is an excellent source (and a fun one) to learn more about style choice vs. grammar rules. A more formal tome that helps with basics but isn’t any fun is The New Fowler’s Modern English Usage (Fowler and Burchfield).Mortal Syntax: 101 Language Choices That Will Get You Clobbered by the Grammar Snobs—Even If You’re Right by June Casagrande. The more you know about choices, the better writer you’ll be. You will not always need to cater to gatekeepers. · It Was the Best of Sentences, It Was the Worst of Sentences: A Writer’s Guide to Crafting Killer Sentences, by June Casagrande. This is the best single book to review before you begin to edit any major writing project. · StyleEase for Chicago Manual of Style, by Kate Turabian. · A Manual for Writers of Research Papers, Theses, and Dissertations, Seventh Edition: Chicago Style for Students and Researchers by Kate L. Turabian is an excellent resource for academics. · Perrin and Smith Handbook of Current English has been around a long time. When you have read it, you will know the difference between temerity and timidity—or at least know to look them up. “Half knowing a word may be more dangerous than not knowing it at all” is the kind of truth you will find within its pages. Trouble is, you may need to search for it in a bookstore that sells used books or watch for it at garage sales. · The Elements of Style, Fourth Edition, by William Strunk Jr., E. B. White, Roger Angell. See my cautionary notes in this book about using Elements as if it were The Ten Commandments. · The Describer’s Dictionary: A Treasury of Terms & Literary Quotations, by David Grambs. One of my favorite references for creative writing. · When Words Collide: A Media Writer’s Guide to Grammar and Style (Wadsworth Series in Mass Communication and Journalism), by Lauren Kessler and Duncan McDonald. 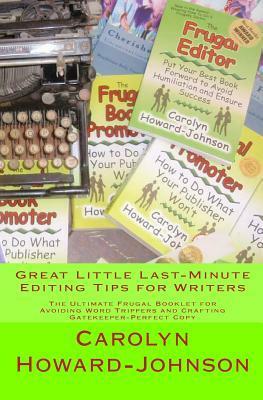 Perfect for freelance writers, copywriters, journalists, media writers. The Ultimate Frugal Booklet for Avoiding Word Trippers and Crafting Gatekeeper-Perfect Copy full of wordtrippers and some help on style choices. 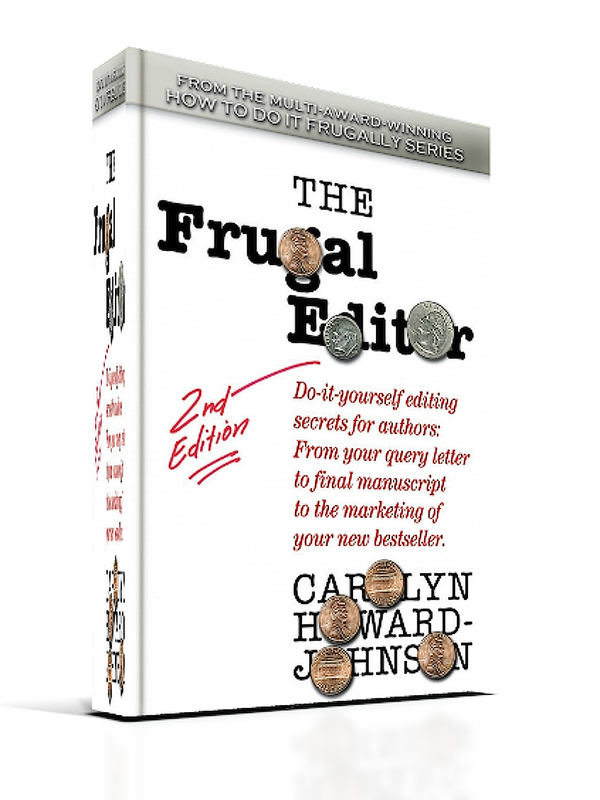 The newly formatted Frugal Editor is available for e-readers and will be published in paperback in July of 2014. I have more books than I can read. My shelves are stacked three books deep with books squeezed in everywhere they can fit, and new books arrive in the post almost on a daily basis. I don't need more. I turn down offers of books every day, and yet, I'm strangely attracted to the Biblio-Mat. I don't live in Toronto, CA, where the Biblio-Mat is housed - in a very cool looking bookstore called The Monkey's Paw - but if I did, or if there were one near me (there isn't even a bookstore nearby anymore), I'd be at it regularly to put $2 into the machine and take my chances on a randomised antique book, delivered like a gumball, out of the slot at the bottom. Why? It's certainly not because I need something to read - there is a gorgeous stack of great books right here awaiting my attention. Perhaps it's because the machine itself is kind of retro, with a cover like an old Penguin novel. Maybe it's because it makes old fashioned noises like bells, whirs and clinks (and I'm feeling nostalgic for that kind of noise). You can have a look and listen yourself here: http://vimeo.com/53679084. Or maybe it's because, as Stephen Fowler, owner of the Biblio-Mat and The Monkey's Paw puts it, there's a sense that the book that comes out the bottom is choosing you personally. That is, of course, the serendipity that makes it so appealing. 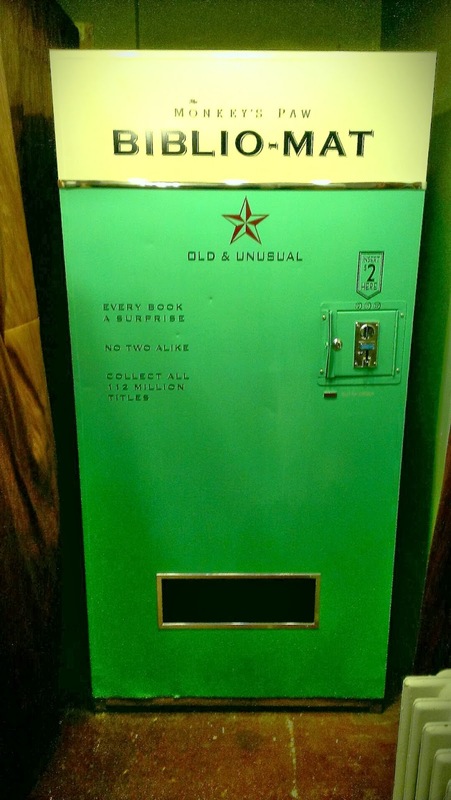 It's a lucky dip for readers - a tiny bit of a gamble that won't leave you broke. What book lover could resist that?